It’s been so perfect out but I’m definitely glad I packed some layers. 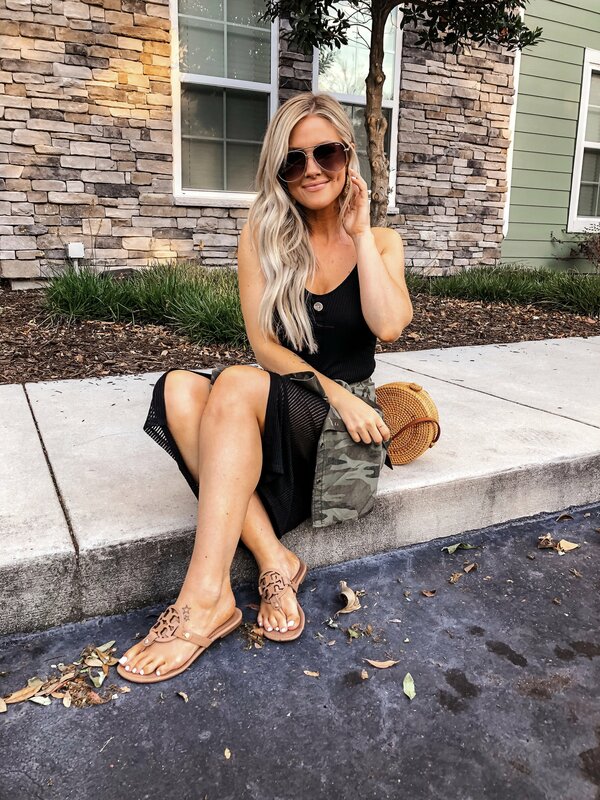 I had originally planned on wearing this dress with a heel to dress it up a bit but knew I’d end up getting chilly so I decided to go with flats and add this camo button up around my waist just in case – and I actually ended up LOVING the look even better! It was definitely more dressed down but it’s perfect for a low key night and sooo comfy! I love this body con dress by itself too! If you haven’t tried this trend yet, this midi dress is a great one to have. The material is super forgiving and much more flattering then most I have tried on. I actually ordered one size up thinking it would work better but that definitely wasn’t the case – so I would stay true to size with this one (I’m wearing my usual XS here). I could seriously style this so many ways which makes it a great staple to have for the summer coming up (with a denim jacket and sneakers would be adorable too!). If you find yourself loving this button front dress trend like I do, Express has a few different styles to choose from and they are all so cute! I’ve linked my faves below along with a few other items I brought with me on vacation that you’ll see throughout the week! Express has been super generous to offer you all $25 OFF your $100 purchase online AND in-store with Ring code 8150 now through 4/15/19, Terms & Conditions Apply. Shop this look below and thanks so much to Express for sponsoring this post! You should do a post about “15 pieces I can’t live without” so we can shop must haves. Love your blog. Love it! 😍 Did you also get your regular XS in the Camo button up shirt?